Created in a covert laboratory by splicing DNA from the strongest and most skilled soldiers, the "Omega Soldier" has been given the strength and weapon skills to become the Tan army's worst high-tech threat! Army MenÂ®: Green Rogueâ„¢ incorporates a 3rd person shooter with coin-op shoot 'em style gameplay that will raise the heartbeat of anyone who dares to accept the challenge. 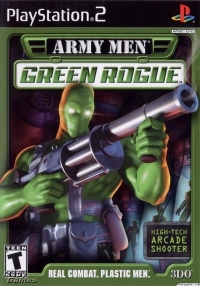 Unlike previous releases under 3DO's prolific Army Men brand, Green Rogue is a character-based game featuring action and adventure from a third-person perspective. Players take the role of the Omega Soldier, a powerful one-man army, biotechnologically enhanced with genetic coding taken from members of the Green Army's Bravo Company (and from the series' uber-hero Sarge himself). 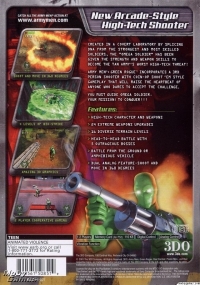 Army Men: Green Rogue is designed to offer old-fashioned, third-person shooter gameplay in a detailed PlayStation 2 environment. As in classic arcade games like Heavy Barrel or Ikari Warriors, players guide the hero through thick forests and open meadows, filling the air ahead with a spray of bullets to eliminate continuous waves of approaching enemies. As in many contemporary PS2 games, Army Men: Green Rogue features 3D-rendered backgrounds and smooth polygonal characters. Keep and eye on the horizon and a finger on the trigger as the Omega Soldier blasts his way to victory. BECOME THE TAN AMY'S WORST HIGH-TECH THREAT! ANYONE "HO DARES TO ACCEPT THE CHALLENGE. YOU nusT GUIDE onECA SOLDIER.